It has been a while since I had last visited Cape Breton, and as the summer wound down, I decided I needed to do a few “summery” things before the great weather passed without anything significant to remember it by. My friend’s family has a cottage in East Bay, on the Bras D’ors lake, and it had been a couple of years since both he and I visited. 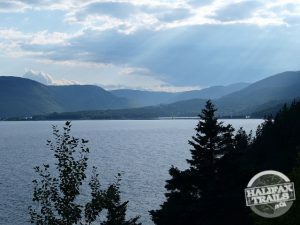 The drive to Cape Breton is always enjoyable in the summer, as the scenery gets progressively better the further you go. Entering Antigonish County, “the highland heart of Nova Scotia” you begin to get a feel for the highland landscape and begin to see the Celtic heritage that Nova Scotia is rooted in. Past this point, anywhere you go at any given time, you are likely to hear bagpipes, fiddles, and people indulging in a few spirited drinks at a local ceilidh or festival. In the words of local Cape Bretoners; the day the Canso Causeway was constructed, was the day that Canada joined Cape Breton. That statement gives you a perfect insight into the sense of humour and pride present within them all. To this day, the causeway provides a landmark which crosses into beautiful scenery, great people, proud culture and storied history. The arrival at my friend’s cottage is met with extreme relaxation and summertime good feelings, and an urge to do absolutely nothing. Upon arrival in Cape Breton, it is customary to first visit the liquor store, and stock up on Gaelic celebration fuel (beer, whiskey andÂ wine). Once set up at the cottage, all that was left to do was unpack, put beer in the fridge, locate the most comfortable deck chair, and take some deep breaths of the warm salty air. The Bras D’ors lakes are not what we are used to when we think of lakes. They are salt water, and the largest of their kind in the world ( According to myself? ). Boating and swimming in the lake were fantastic, warm like most lakes in August, salty like the ocean, and endlessly large. Since the lake is salt water, many saltwater fish live here. Jigging for cod is something you can’t do in any other lake, and something I am equally unsuccessful at regardless of location. Our days were spent on and around the lake, exploring islands, swimming, fishing, and boating. The water was as warm as a heated pool, the rugged hills were a deep green, the sky a light blue, and the calmÂ dark waters of the lake reflected a couple of eagles who wereÂ cruising with the clouds above. There was no choice but to be 100% relaxed. Even the cottage is a thing a beauty. It was built over 200 years ago, by a couple of brothers from New England who ran a farm here in the summers, and returned to New England as shipbuilders in the winters. The cottage is constructed just as you would imagine 19th-century expert shipbuilders and master craftsmen would. The ceilings look like the deck of an old sailing ship, banisters and stairs are made of thick dark wood, each piece of woodÂ hand milled, carved and joints made without glue or nails. It’s not hard to imagine being under sail on the Atlantic, with the smell of the salt water and the look of finely crafted woodwork. The evenings were spent in true Cape Breton fashion, enjoying many fine beverages and having nothing but good times. You don’t have to travel far, or travel at all to find a celebration. If you’re lucky you will stumble on a good old fashion Ceilidh, complete with fiddler, bagpipes and a culture of people who have been partying this way since their Gaelic ancestors settled here in the 1700s. Waking up after an evening of heavy drinking, to a level which is unacceptable in most social settings, is both expected and embraced in Cape Breton. In our case we had a miracle, all-natural remedy for hangovers. 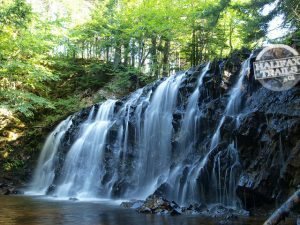 A large cool, fresh, waterfall 5 minutes down the road provided an instant cure, and with a bar of soap, I wasÂ ready to take on another day. 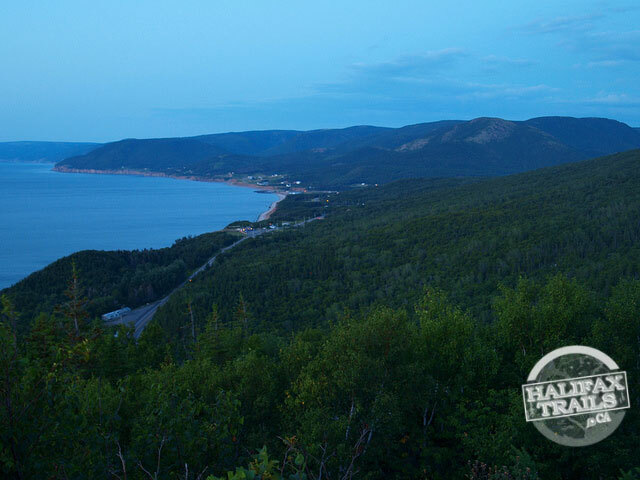 No trip to Cape Breton is complete without exploring the Cabot Trail and the surrounding Highlands National Park. 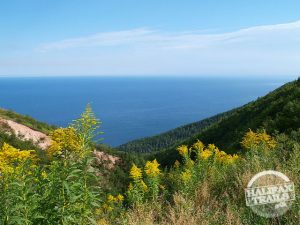 The Cabot Trail is a world-renowned route, first used by European explorer John Cabot, and now a mecca for people looking for a world-classÂ scenic drive. You can quickly see how huge the tourism industry is here, but you also quickly see how it is hugely different. It’s easy to see tourist traps and people looking to make a quick buck at any popular destination around the world. The places are usually run by “friendly” people who are more than happy to take your money. Cape Breton has no shortage of tourist-friendly spots, but these spots are different, and it’s the people that make them different. You begin to realize that the friendliness of the people you encounter is not because they want your money, or because they know you’re a tourist and want you to have aÂ good impression. They’d just as soon have a good conversation or share a joke and treat you the same way they’d treat locals. Being genuine is part of the culture here. The drive itself is absolutely spectacular, and no videos, photos or descriptions can do it justice. The large rolling green hills and the blue ocean provide some spectacular views. 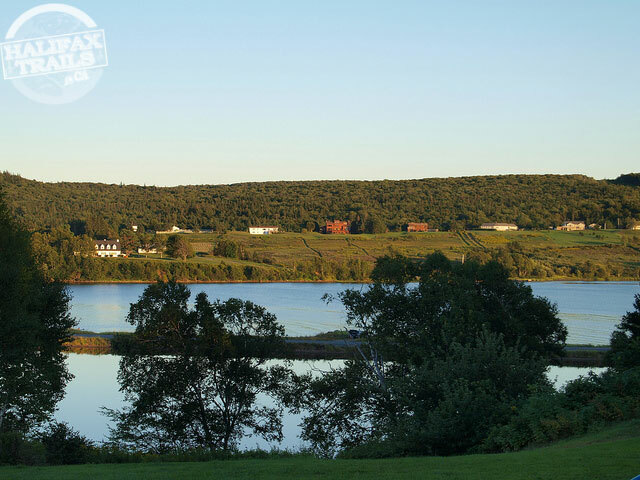 There is no shortage of fantastic places to eat, shop, golf, hike, and stay along the way, as well as many small towns and communities steeped in Gaelic, Native and Acadian history. The town of Cheticamp is a great example of the combination of natural beauty, culture, and history boasted throughout Cape Breton. The town itself is surrounded by green mountains and borders the ocean. The people are French-speaking Acadians and have managed to hold onto and celebrate their language and culture amid an English speaking province. (I highly recommend the seafood chowder, while seated on a patio). Cape Breton once again left me re-aligned. You really can’t go wrong with a spring/summer or fall visit to Cape Breton. Whether you’re looking to hike, camp, drive, bike, kayak, fish, golf, dine, drink, or just explore, this is where you need to go. Cape Breton is a lot of things to a lot of people, but one thing it is to everyone is beautiful. 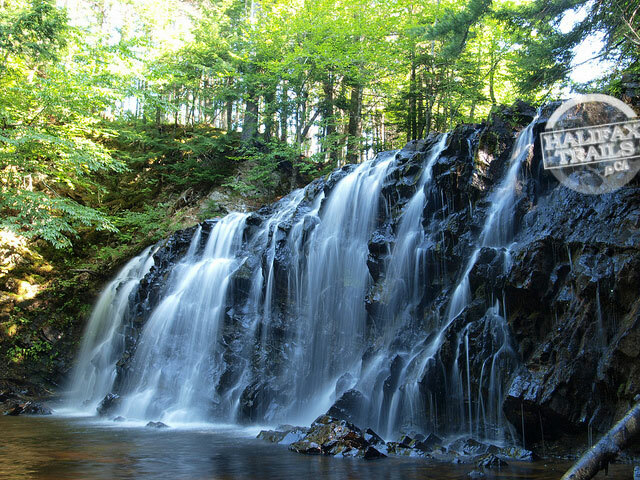 Cape Breton is equal parts natural and cultural beauty and deserves its designation by National Geographic as one of the top two places in the world for sustainable tourism. Your description of Cape Breton tugs at every string (heart, home, nostalgic). It also comes very close to capturing the true uniqueness, in its beauty, its people, and its life. Sure makes me want to go back. Nice job. Thanks. 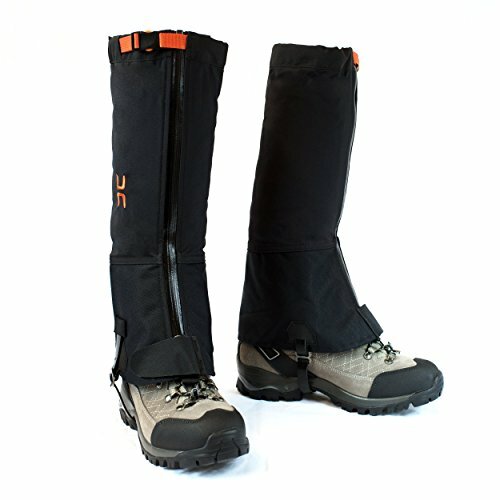 Submit a guest post for consideration. Please support HalifaxTrails.ca by adding me to your whitelist in your ad blocker. Ads are currently what makes this work possible. Thank you! A ridiculous amount of coffee is consumed while working on HalifaxTrails.ca. Add some fuel if you'd like to keep me going!